Lisa Kempskie, violin and viola. "Encore! Encore! Words can't begin to describe your performance during our ceremony! My family and friends are still talking!" 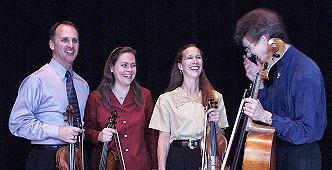 Kathy F.
Robert, Lisa, Lynne, and Roger have performed together as The Woodvale String Quartet since 1985, providing elegant classical chamber music for hundreds of weddings, receptions and public/private/corporate events in New England. Throughout these years the quartet has developed a reputation for its ability to please all audiences with its wide variety of repertoire, rich beautiful sound and prompt, professional, reliable customer service. Ms. Canavan has been a freelance violinist in the New England area for over 20 years, performing with The Civic Symphony of Boston, Cape Ann Symphony, New Hampshire Philharmonic, Indian Hill Orchestra, the Concord Symphony, the Claflin Hill Symphony, and Worcester Symphony Orchestra. She is currently Assistant Director of the Worcester Polytechnic Institute Orchestra and chamber music coach for the Medwin Honor's String Quartet. Among her many past accomplishments, Lynne has taught traditional and Suzuki violin at The Westford Suzuki School and at Indian Hill Arts in Littleton, MA. She also successfully designed and implemented a pilot string program for the Billerica Public School system. In addition to Lynne�s classical music endeavors, she also enjoys performing as a strolling violinist for memory impaired residents in assisted living communities throughout the Boston area. Based in New England, Mr. Kimball has performed throughout the U.S., Canada, Europe, and the Middle East with numerous ensembles and orchestras. He has accompanied several artists including Carly Simon, Warren Vache, Billy Eckstein, The Ink Spots, Little Anthony, The Shirells, Frankie Avalon, The Coasters, Fabian, Leslie Gore, and the late Del Shannon. Roger has numerous recording projects to his credit, including three recent critically acclaimed CDs by jazz clarinetist Harry Skoler (BROWNSTONE Records). He is a professional music arranger and copyist, and functions as one of the principal arrangers for the quartet. He hosts a website, www.rogerkimball.com, which contains additional information regarding available jazz or dance ensembles for special events.